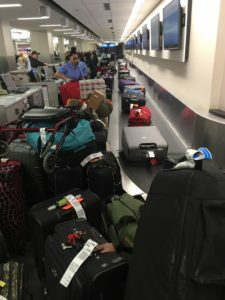 The luggage conveyor belt at Des Moines International Airport. Iowans who are headed to the state’s busiest airport this morning will find it even busier than usual as this is among the heaviest air travel days of the year. Kevin Foley, executive director of the Des Moines Airport Authority, says you should expect longer lines at security, more traffic, less parking and plenty of company. Despite all of that, Foley says try to maintain your holiday spirit. Even infrequent fliers know they’re not supposed to bring firearms onto the plane, yet several people still try every year. While the TSA rules have relaxed since Nine-Eleven and once-banned items like nail clippers are now okay to bring on board, many passengers continue bogging down security checkpoints by making poor packing decisions. Check the website TSA.gov before heading for the airport to familiarize yourself with the latest protocols. Also, it’s a wise idea to log on to your airline’s website to double-check your flight status. While you’re at it, visit the airport’s website, too, especially if you’ll be parking your vehicle there. To be safe, arrive 90 minutes before your flight. Remember to skip wrapping any gifts. Wrap them at your destination as they’ll have to be unwrapped to go through security.